Recent trips included the D – day event at Hunter’s Meet, and a day trip by train to a very blustery Southend. In July, we enjoyed the sunshine at Bexhill-on-Sea, where the fete had a 1920’s theme. One of the events was to try to break the world record of the most people doing the Charleston for five minutes. One of our members joined in, but sadly there wasn’t enough people to create a new world record. Another popular outing was a trip to the East Anglian Transport Museum, where we enjoyed nostalgic rides on the trams and trolleybuses, and we were treated to some very informative talks by the guides there who certainly know their history. There are more trips planned to the seaside through August and September, and also trips to the Spotlight in Broxbourne, where we enjoy the musical treats they offer, and have a sing-a-long. Picture of FSV trip to the D-Day Cabaret at Hunters Meet. We will be out and about in the area fundraising and promoting our group, so if you spot us, please do come over and say hello. Alan, Lisa and the FSV team. Times are changing for Four Swans Vision. We are currently desperately seeking a new office, as Our home for over the last four years, Bartholomew Court, is being refurbished and turned into residential flats. FSV has been there since our Inception. But onwards and upwards! Despite not having an office base at the moment, we will be working hard and holding our Monthly Meetings 10.30am to 12.30pm on the first Wednesday of the month, at the CVS Community Shop, which is on the right-hand side of where our office was and is next to the CEX Shop (that is spelt C for Charlie, E X for those with screen readers). 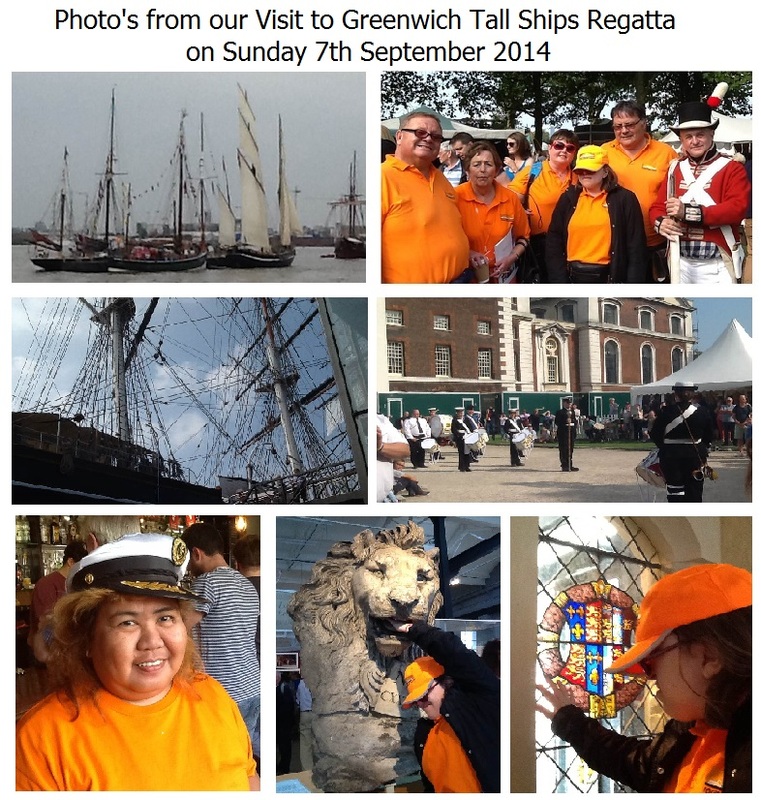 All our regular Activities/Outings and Sports continue as normal too. In January Four Swans Vision Members helped the firefighters at Cheshunt Fire & Rescue Station in their Emergency Rescue Assistance drills. This gave the firefighters a better understanding of casualty extrication of blind and partially sighted people who are trapped in a vehicle. See the pictures! In February, we had a trip to Wood Green, to see the show Cockney Ding Dong. 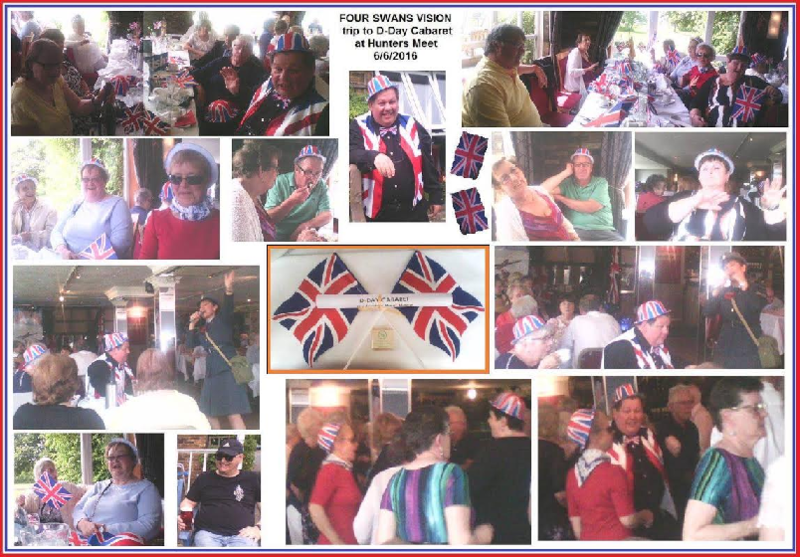 Our members thoroughly enjoyed the show, which consisted of a meal, a sing-a-long and a comedian. In March, we had a trip to the Spotlight, in Broxbourne, to sing-a-long to the show That’ll Be The Day. We plan another Art Workshop where members can create their own masterpieces, a ‘Touch To See’ book club, also, we are planning trips to the seaside, trips to museums where our members can enjoy the touch tours, and trips to the theatres where we can enjoy a good show. Our V.I.P. Tennis and V.I.P. Golf sessions are very popular, and they certainly help keep everyone active. We also have fundraising outings planned at Grundy Park, Hoddesdon, Bishops College and Waltham Cross. So please come over and say hello if you spot our bright orange gazebo at any of the events/fairs in the area. 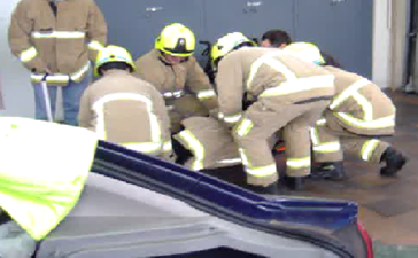 The car roof being ‘peeled back’ during the training session at Cheshunt Fire & Rescue Station in January. Our member Nancy was lifted out of the car on a spinal board during the training session at Cheshunt Fire & Rescue Station in January. Also we saw/heard two shows at the Spotlight Broxbourne - Chicago Blues and the 25th anniversary show of That'll Be The Day in which we were boogying in the isles! Guide Dogs training centre in Woodford was very interesting, we saw/heard all about their training and got the chance to smooch some of the pooches. Some members were planning to do some dog napping (wink) – so some joker on the way back in the minibus, played their barking sound on the iPad, ha ha ha! We have been fundraising at various events with our teddy tombola. FSV Visually Impaired Peoples’ Tennis is great and we have been going for three and a half years with our dedicated coaches Gerry and Karl. FSV Visually Impaired Peoples’ Golf is on par. Activities coming up are our last two Creative Workshops, a show – The Elvis Years at the Spotlight Broxbourne some fundraising and our Christmas meal/show at Woodgreen. 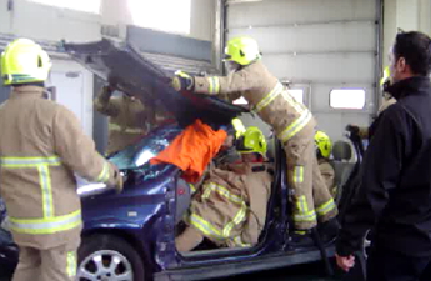 Next year we are going to be Guinea pigs for Cheshunt Fire station – to help them practise taking care of visually impaired people who have been trapped in a car and we have various other trips and activities planned, please contact us for further details. 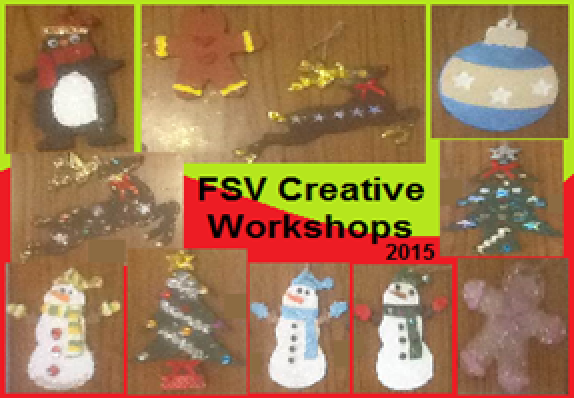 Picture of some of our creations from FSV Creative Workshops. Wishing ye a Happy Christmas and a Prosperous New Year, Alan, Lisa, and the FSV Team. Four Swans Vision have been keeping busy this past few months! We also have more trips and activities planned... We have been to the Poppy Factory in Richmond, where our members were enthralled by its history and enjoyed making their own poppies. Also we had a great day out at Brighton, where we soaked up the sunshine and enjoyed the thrills on the pier. We had a couple of visits to Broxbourne Civic, where we saw the show Blitz and then a few weeks later returned to have a sing-a-long at the show Magic of Motown. We also attended some local events to fundraise for FSV at Grundy Park, Holmesdale Tunnel Open Space, Hoddesdon and Waltham Cross, where we met lots of people interested in our group. 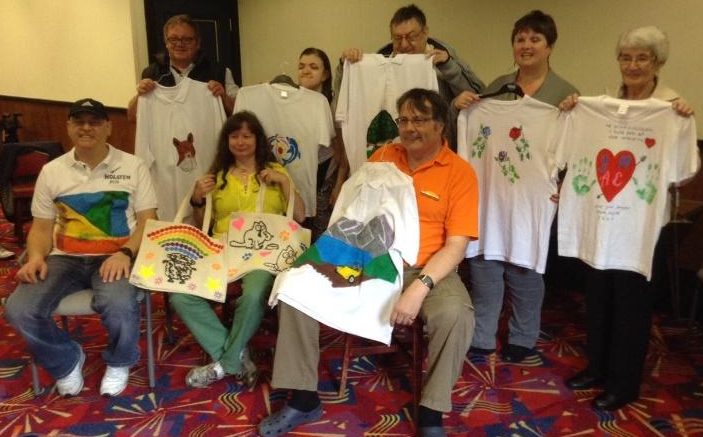 Our members also enjoyed our Creative Workshops, where they designed and painted their own t-shirts, pillow cases and bags. 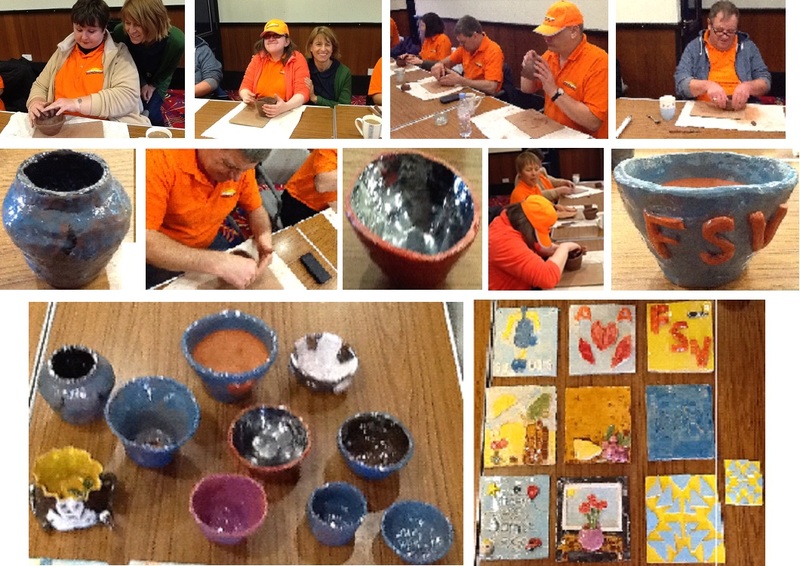 We have two more Creative Workshops planned for this year and are looking forward to creating more masterpieces. Trips planned are to the Guide Dogs National Breeding Centre, an afternoon boat trip, a day trip to Margate, more singing to be done at Broxbourne Civic and more activities that are still to be finalised. Visually Impaired Persons' Tennis is still a hit with our members, who are also getting into the swing of Visually Impaired Persons' Golf. We will be out and about at more events locally, so please look for us in the bright orange gazebo and come and say hello. FSV Creative Workshop One: April 8, 15, 22 2015. FSV Creative Workshop Two: August 26, September 9 & 23 2015. FSV Creative Workshop Three: November 11, 18 & 25 2015. The Workshops times are 10am to 4pm and take place in the CVS Community Shop*, High Street, Waltham Cross. Phone: 07985536216 or Email: [email protected] to reserve your place. *The CVS Community Shop is the one with darkish blue shutters next to the entrance to our office building on right hand side when facing our glass doors. 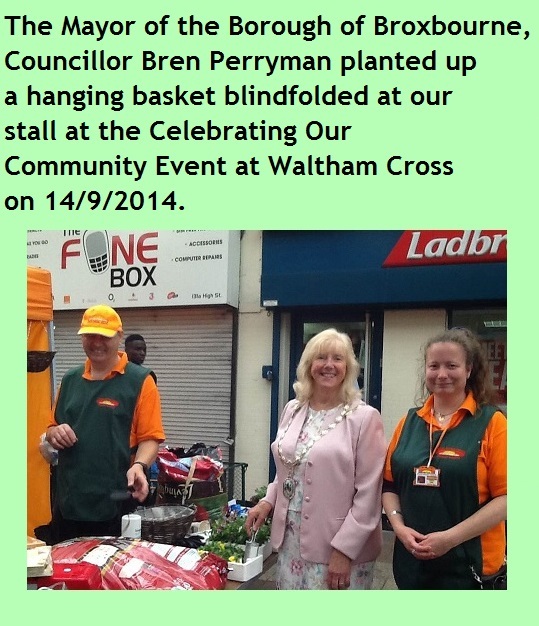 Photo of The Mayor of the Borough of Broxbourne, Councillor Bren Perryman planting up a hanging basket blindfolded at our stall at the Celebrating Our Community Event at Waltham Cross on 14/9/2014. Four Swans Vision made the most of the hot sunshine this summer. 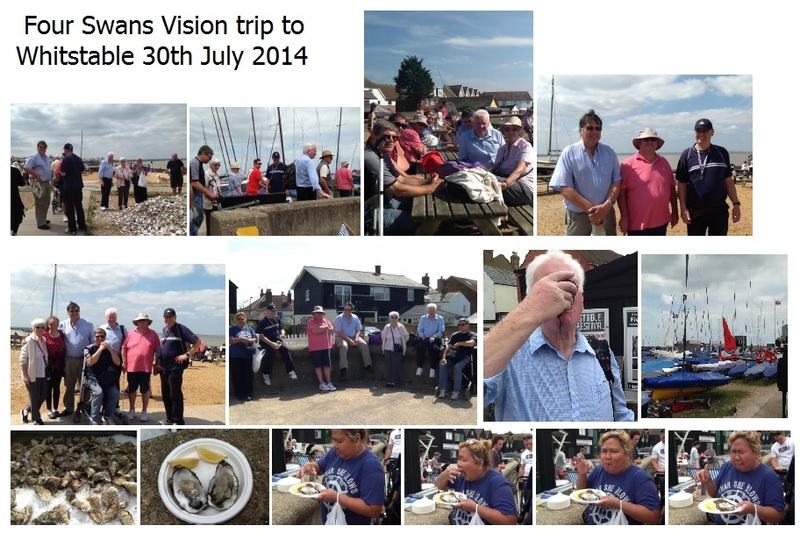 We enjoyed a day at Whitstable at the oyster festival, and some of our members had an oyster or two. We also enjoyed a day out at Southend also at Hastings where we all tucked in to a fish n chip dinner and enjoyed afternoon tea from the café at the top of the cable car. 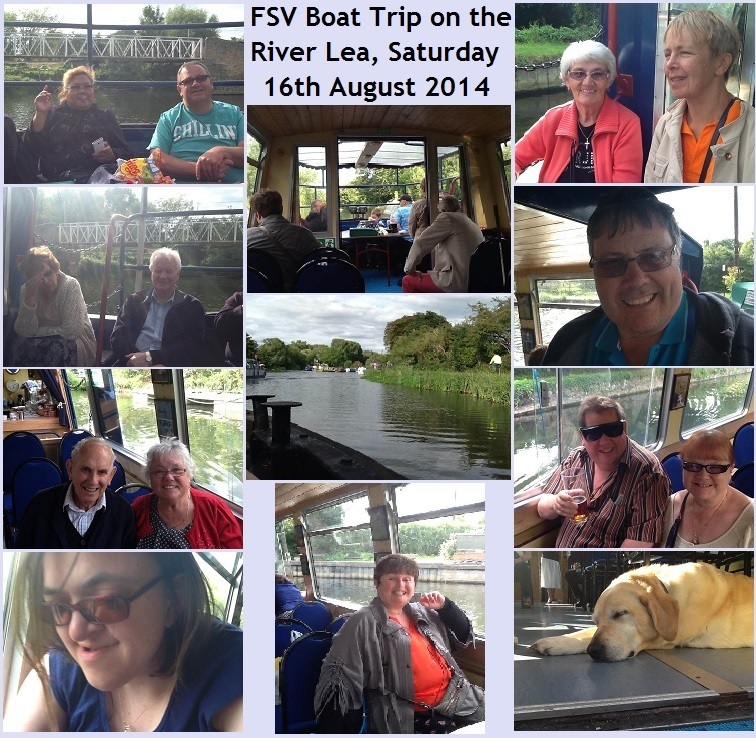 Another trip that our members thoroughly enjoyed was a picnic along the tow path, followed by a boat trip along the River Lea. We have also been out and about in the local area fundraising. We were at the Holmesdale tunnel and Waltham Cross summer events and we are planning to be at the Waltham Cross Christmas event. It was great to have the Mayor of the Borough of Broxbourne, Councillor Bren Perryman plant up a hanging basket blindfolded. In October we bid a fond farewell to Sue-Jane O'Keefe, small groups development worker from CVSbeh, she has been an absolute credit and has helped us out many times since our conception. She is a very knowledgeable person in many areas and goes far above the call of duty for anyone in need. We wish Sue-Jane every success for the future. Also in October, we took part in Supernova showcasing Four Swans Vision Visually Impaired Persons' Tennis Club. After a trip to a musical in November at Broxbourne, we have trips planned to Broxbourne Civic, Richmond Park, Kew Gardens and another picnic and boat trip either on the River Lea or the River Thames next year. 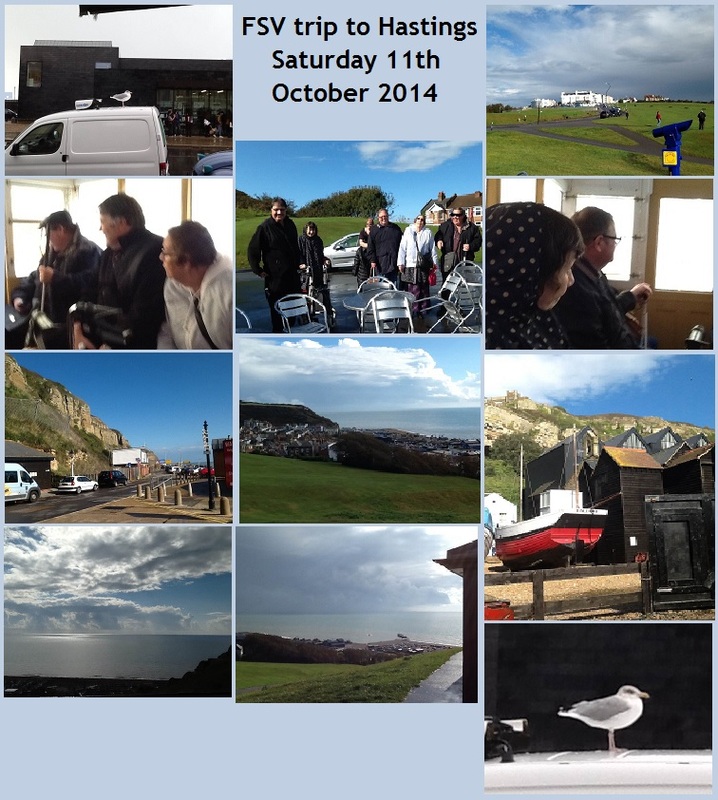 We will also have a few trips to the seaside as all our members enjoy these days out. The Committee at Four Swans Vision would like to thank everyone for their support and wish everyone a Merry Christmas and a Prosperous New Year 2015. Four Swans Vision are certainly keeping busy. 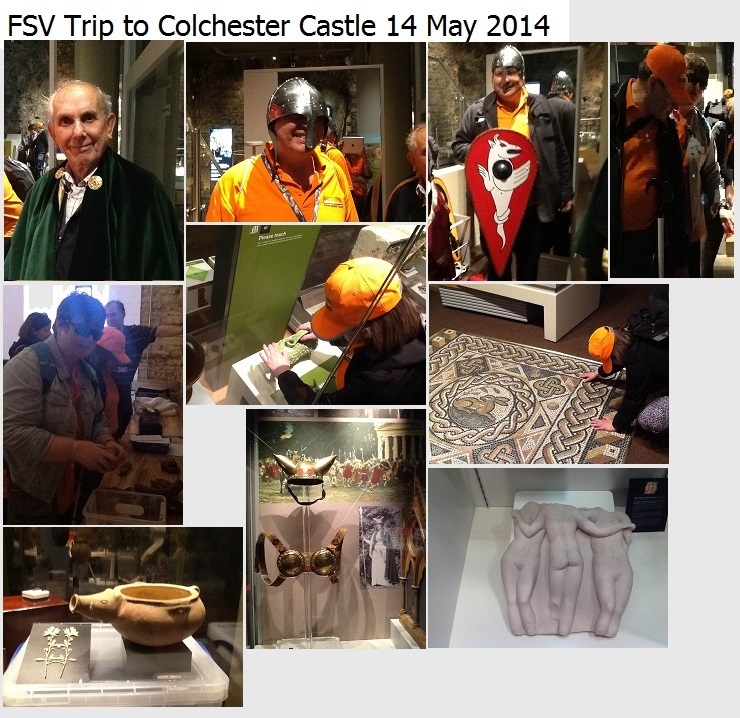 In May we had a trip around Colchester Castle to discover its dark secrets there were objects that you could handle and we had fun trying on various costumes and helmets. 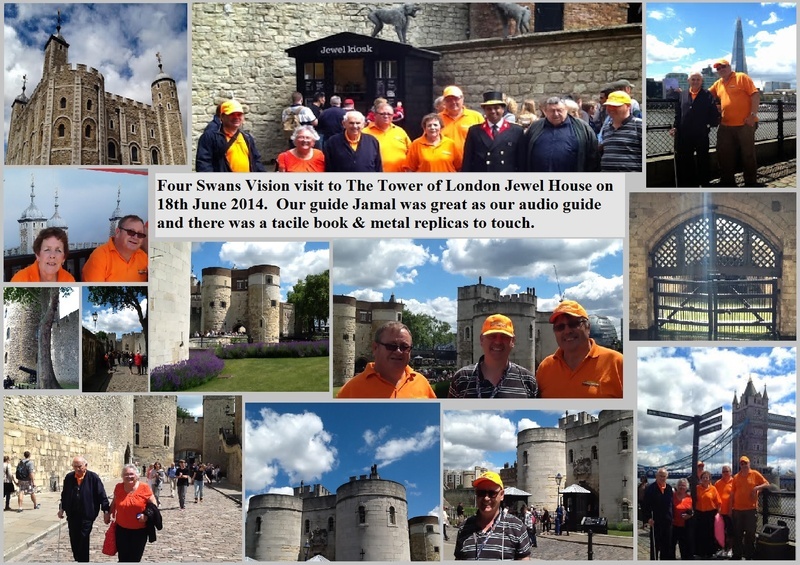 In June we had our own descriptive tour of the Jewel House at the Tower of London which everyone thoroughly enjoyed, our guide Jamal was great. We have also been out and about fundraising having a stall at the Waltham Cross Summer event and the Tea-on-the-Tunnel at the Holmesdale Open Space. Future trips include The Oyster Festival in Whitstable, Kew Gardens, Richmond Park, a boat trip along the Thames and another visit to the Tower of London to explore other parts we didn’t get to last time. 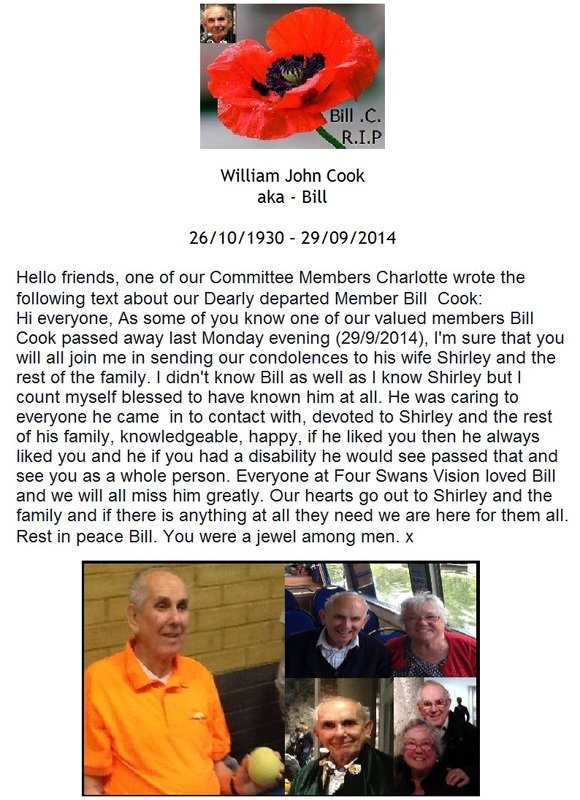 We also plan to be at the September event in Waltham Cross and other events in the local area. We have some trips lined up, including a trip to Stevenage F.C. in April, a trip to a museum in Norwich in May, a touch tour of the Tower of London in June and a trip to the seaside in July. Our regular sessions of VIP Tennis are still a hit at Grundy Park. We also have our Sensory Garden Outreach Project at the Holmesdale Tunnel Easter Event in Waltham Cross on 12th April, where people can plant up a plant pot blindfolded. We are also planning to be at Hoddesdon Town Centre on the 10th May, Waltham Cross Summer Event on 7th June and back at the Holmesdale Tunnel on the 12th July for the summer event. We will also be holding our teddy tombola’s, so please come along and say hello. FSV VIP Tennis is on Fridays, term-time, at Grundy Park Leisure Centre.